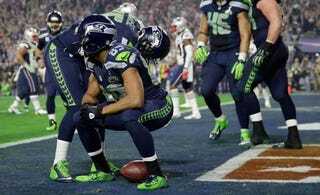 On Sunday, Doug Baldwin celebrated his touchdown to put the Seahawks up 24-14 by pooping the football. (Seattle never scored again. Curse of the poopball? Hmmmm.) Only, the dozens of millions of people watching at home never saw it, because NBC abruptly cut away. Baldwin said his celebration "between me and the guy it was directed at," which turned out to be true, because no replay was shown, and Al Michael and Cris Collinsworth never once mentioned it, or the unsportsmanlike conduct penalty it drew, which seemed like broadcasting malpractice. It was a big moment, and 15 big penalty yards! "And to my guardian angel, Dawn Howard, I continue to feel you and hear your voice in every thing I do...all the way do to the subtle "Hey, be careful...that idiot who just scored is gonna pretend to drop his pants and poop out a football...you may want to hasten that cut," Howard said. Thankfully, a fan in the stands filmed Baldwin's celebration, so we can ruin at least some of the children that Dawn and John Howard tried so hard to shield.